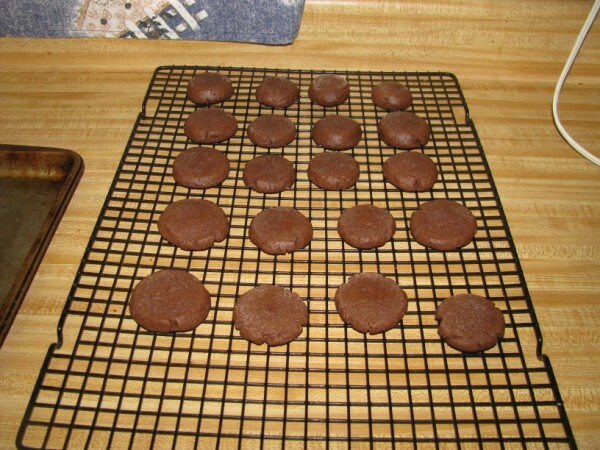 Num Yummy….I smell holiday baking! I get the BHG.com newsletters (like everyday) and they had a cookie newsletter the other day. I liked the look of the cookies that were on the newsletter, itself, but I didn’t have the ingredients on hand. 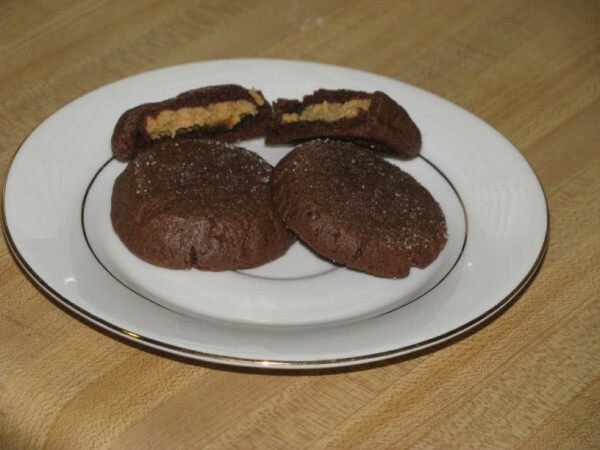 So I went browsing through their other cookies and found some called Peanut Butter Munchies. Mmmmmm, doesn’t that just sound good?! 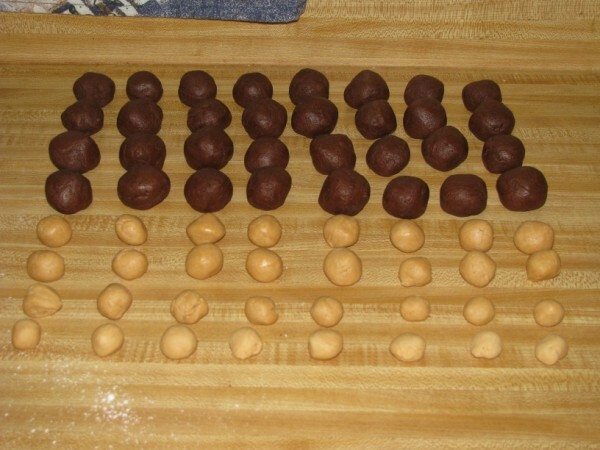 You mix up the chocolate and peanut butter cookie mixture and roll it up into 32 balls that are about 1 1/4 inches. Ball rolling and more ball rolling was followed by….you guessed it! EVEN more ball rolling. 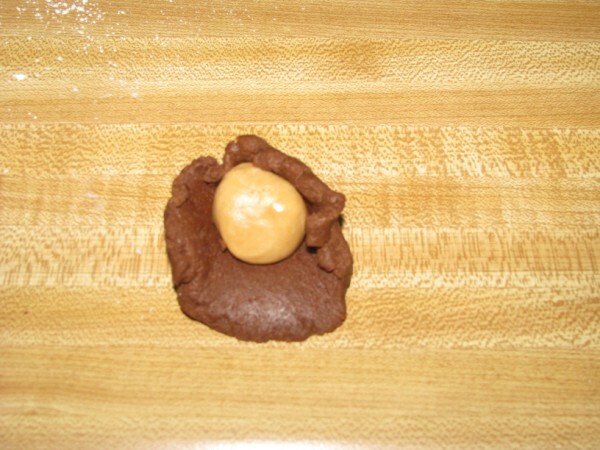 This time, I had to flatten a choco/peanut butter cookie dough ball and place a peanut butter/conf. 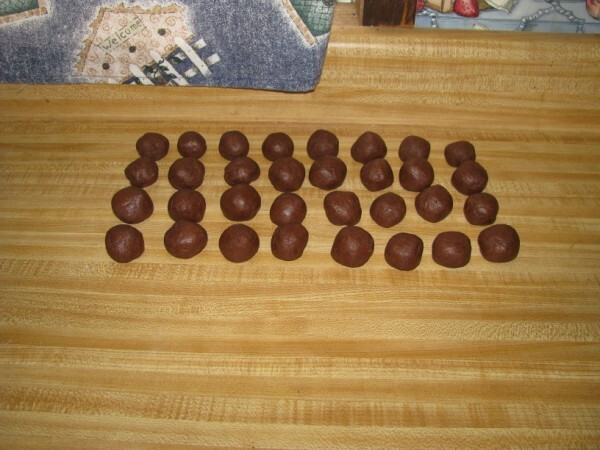 sugar ball in the middle and roll/wrap the chocolate back around it. Yeah….ticking on about 1 1/2 hours of prep and oven had beeped that it was already preheated about an hour and 15 minutes prior. But WAIT! We aren’t done yet! Funny how those things took me nearly 2 hours to prep, but only 8 minutes in the oven! But boy did they smell good. Mmmmmmm! Can you smell’em? These weren’t as good the first day as they were the second day. They don’t really last much longer than two days around here when you have two little sneaky hands! What is my plan for the next batch of cookies? Gingerbread Drop Cookies! I bet those are good. And it doesn’t have as much molasses in it as the last time I made gingerbread cookies. THOSE nearly made me gag and they got tossed out. Trial and error….trial and error. 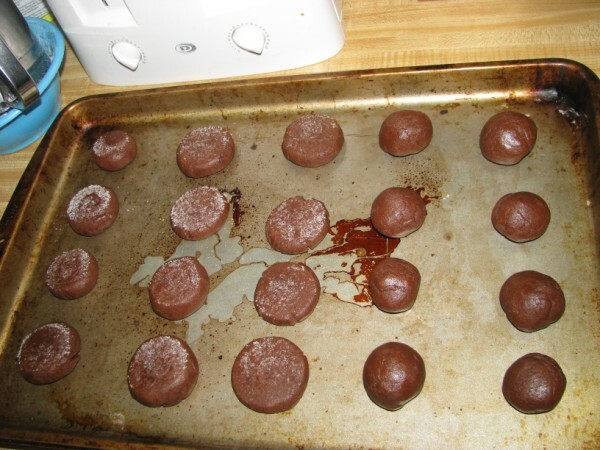 🙂 I can’t forget to make my favorite cookies though….snickerdoodles! Everyone has got to love the simplicity of snickerdoodles! LOL! Now on to crafty, loomy, ornament goodness! These ornaments are all designed by Brenda Myers and I just love them! I am trying to make them in my every spare moment, but let’s face it…..those are fewer than I expected! 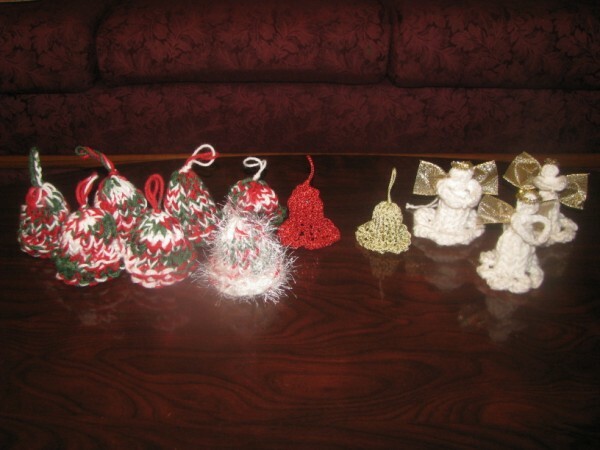 If anyone wants to participate, she is teaching some more of her ornament designs next week in the Loom Class! 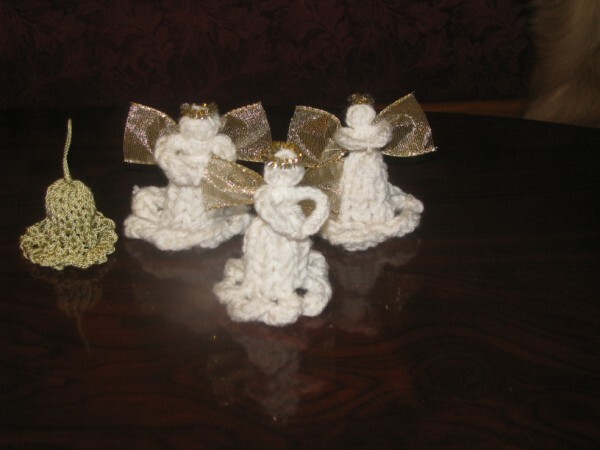 These are her Knifty Christmas Bells, Bright Bells, and Belle Angels. I REALLY LOVE THE BELLE ANGELS! Here is a pic of just the Belles. 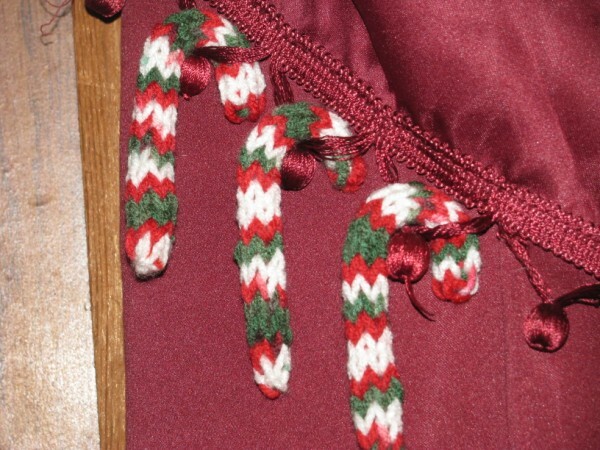 And here are some of the Candy Canes. I don’t have a clue where the pic of the Mini Christmas Wreaths went. 😛 Oh, well. I’ll try to update more often. But, I know that the next few weeks are gonna be REALLY busy. I mean, it IS only about 30 days until CHRISTMAS!